In the desert in the south of Oman, solar steam is cheaper than gas-produced one. State-owned Petroleum Development Oman (PDO) commissioned Californian Glasspoint to install the world’s largest solar steam producing plant, Miraah, next to the Amal West oilfield. 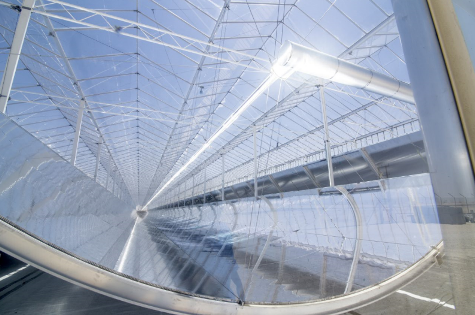 Construction of the concentrating solar thermal collector field of 1 GWth began at the end of 2015, and first steam generation is expected to start in 2017. The steam is used for heating the heavy crude oil in order to improve flow properties and make it easier to pump the oil to the surface. This process is called enhanced oil recovery (EOR) and the heat is currently provided by gas-fired steam boilers. The photo shows the 7 MW pilot plant of parabolic trough collectors enclosed in agricultural glasshouses. The installation offered promising results during the test phase. The solar project has gigantic proportions: a 1,021 MW plant consisting of 36 glasshouse modules and spanning a total project area of 3 km² (741 acres) with costs around USD 600 million. That’s equivalent to 360 football pitches. Once complete, the plant will produce 6,000 tons of solar steam per day. The gas saved by the new process can be redirected to higher value applications, such as power generation or industrial development. “Many countries have already pumped their lightest, easiest-to-access oil and are now using EOR to reach the heavier varieties,” Rod MacGregor, CEO of Glasspoint, confirmed in an interview quoted by renewableenergyworld.com on 7 October 2015. “Oil companies can spend as much as 60 % of their operating costs on fuel for EOR, using five barrels of steam to make one barrel of oil,” MacGregor said. The biggest thermal energy user in the world is the oil industry, which is why Glasspoint focused on EOR – by far the biggest industrial steam market. Since 2011, the Californian business has been working with PDO on a 7 MWth pilot plant, which produces an average 50 tons of steam a day. “The pilot exceeded all performance targets, paving the way for large-scale expansion,” Kaitlyn Finegan from the Glasspoint‘s communications team said. 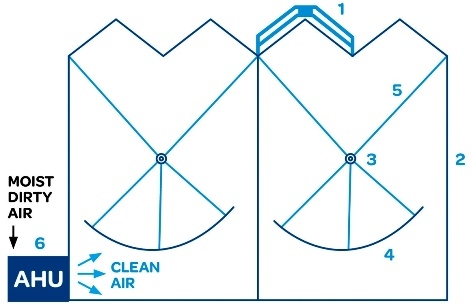 Drawing of the Enclosed Trough Once-Through Steam Generator system: automatic roof washers (1), glasshouse (2), 60 mm, non-evacuated receiver with an air stable selective absorber and glass convection shields (3), parabolic mirrors with a lightweight aluminium honeycomb construction (4), steel rods to suspend receivers from structure (5) and air handling unit (6). In a scientific paper from 2013 (see the attached document), Glasspoint calls the newly developed solar-steam-producing technology Enclosed Trough Once-Through Steam Generator system. “This innovation, when combined with an air filtration system and automatic roof washers, dramatically reduces energy losses due to soiling and wind. In addition, the Once-Through design allows the use of feed-water with total dissolved solids as high as 30,000 ppm to produce 80 % quality steam at 100 bar, matching typical EOR specifications,” the paper summed up the process. Glasshouses are available at low cost and help reduce the material used for the parabolic trough collectors, so that the total costs of the solar energy system will be reduced substantially, according to the conference paper. Total weight of the mirror and frame deployed in the pilot is only 4.2 kg/m². According to metering at the 7 MW demonstration plant, peak efficiency is at 66 %, including soiling losses of 2 % versus 71.8 % EuroTrough efficiency used in the NREL’s System Advisor Model (SAM). The paper assumes that the efficiency of the Enclosed Trough Once-Through Steam Generation system is slightly lower because of the shadowing of the roof structure and glazing losses. However, the cost and performance efficiency gains from being protected inside a zero-wind, self-cleaning glasshouse far outweigh any losses from shading. Dust reduces the efficiency of a concentrating system significantly: At a demonstration plant in California’s San Joaquin Valley, Glasspoint has observed soiling rates resulting in a 12 % per week drop in solar yield between washing times. Masdar in the United Arab Emirates has measured up to a 30 % decline per week. The automated roof-washing system of the Glasspoint technology is capable of cleaning the entire roof surface each night while the collectors are offline. The majority of cleaning water is returned to the gutter system and can be recovered.